Quinoa has been grown in South America for more than 7000 years as a native Andean food. The plant is 2m high and has a annual crop of small seeds of 1-2 mm. The plant can be grown in poor soil with low annual rainfall at high altitudes, 2000-4000 m., and has a high resistance to cold. Quinoa is called grano de oro (golden grain) by the local people. The name not only refers to the shiny golden appearance of the seeds, but also to the high nutritional values of calcium, protein and amino acids and other vitamins and minerals. 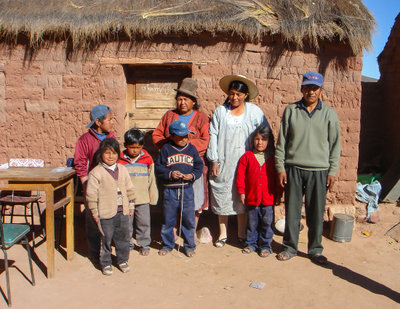 In Bolivia and Peru most people are from indigenous origin and have a strong awareness of their Indian roots. Part of their cultural heritage is the knowledge of food and certain crops specifically suitable for the highlands. Quinoa is one of the most important and authentic crops. QuinoaBol buys from small farmers growing the Real variety with bigger seeds from 2,5 mm. This variety has a higher nutritional content and a better balance of amino acids. The Real variety is high in saponin which gives a better resistance to pests but also increases processing costs. Converting to organic is easy for traditional agriculture and the farmers get better prices than for conventional products. QuinoaBol is a Bolivian company and very aware of the people's demands. It has developed a strong relationship with the farmers and takes care of cleaning, drying and packing in an exclusively organic facility. The Fair trading and the projects based on local needs make it possible for the Bolivians to keep their own culture and traditions alive.